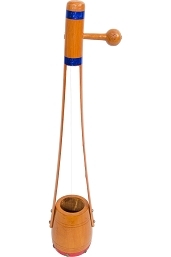 The gopichand like the ektara, is a one-string instrument used in Bangladesh, India and Pakistan. In origin the gopichand and ektara is a regular string instrument of wandering bards and minstrels from India and is plucked with one finger. 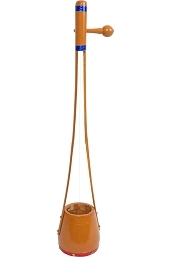 The gopichand usually has a stretched single string, an animal skin over a head (made of dried pumpkin/gourd, wood or coconut) and pole neck or split bamboo cane neck. Pressing the two halves of the neck together pushes the peghead away from the body, thereby tightening the string and raising its pitch. The modulation of the tone with each slight flexing of the neck gives the gopichand its distinctive sound. There are no markings or measurements to indicate what pressure will produce what note, so the pressure is adjusted by ear.